"Great for steamed or fried dumplings, egg rolls, and spring rolls!" Whisk light soy sauce, dark soy sauce, red wine vinegar, chili oil, ginger, sugar, garlic, and green onion together in a bowl; pour into a sealable container, seal, and refrigerate 1 hour. 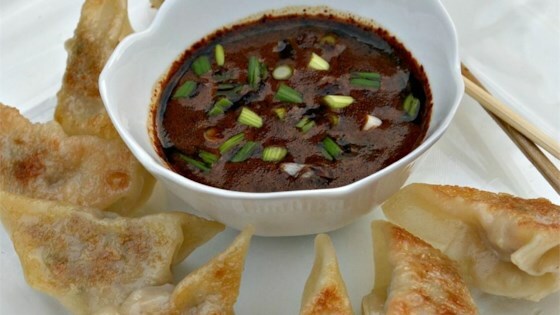 This is a great base recipe for dipping sauce. I use it as a starting point and add what I like from the fridge. My kids loved it. I added a full teaspoon of white sugar and a tablespoon of brown sugar to balance it out. I also toasted some sesame seeds and added them. Turned out great! Absolutely amazing! I've made it a dozen times now and I love it more and more with every batch! Thanks for sharing!